Which airlines let you to buy First & Business lounge access & is it worth it? In the Middle East offering paid for lounge access to all passengers is pretty much the norm. This doesn’t appear to be spreading much outside that area apart from Etihad’s worldwide lounges that allow paid access. There are some airlines that have a club type access program in Australia & the US but for this article I will concentrate on single visit lounge access. I suspect it is unlikely that BA will start offering the same due to the lack of capacity at its London lounges. So what’s currently on offer in paid for access and what do you get for the money? Etihad offers Economy Class passengers paid access to its lounges around the world, including its Premium Lounges in Abu Dhabi, London, Manchester, Dublin, Paris, Washington DC, New York JFK, Sydney, Melbourne and Los Angeles. Prices are for 2, 4 or 6 hours and start at $100 for 2 hours in the business class lounge and $200 for 2 hours in the First Class lounge. You can also pay using Etihad miles which is useful if you have a few spare to use up. The London lounge costs £45 or 7000 miles. Passengers travelling on Etihad Airways Business Class tickets can also pay and upgrade to the First Class Lounge & Spa when flying from, or transiting through Abu Dhabi. You can choose from a 2, 4 or 6 hour upgrade package starting from $200 / AED 735. There is no additional discount for Business Class passengers compared to buying it as an economy class passenger. I think this is a mistake, as I can’t see many business class passengers paying $200 to upgrade when they already have a decent lounge. If it was at a lower price, more people may be tempted to try it. There is an excellent Six Senses spa in the lounge at Abu Dhabi but you will have to pay for the treatments unless you are travelling First class. If you want to look at what’s available, here is the spa page. 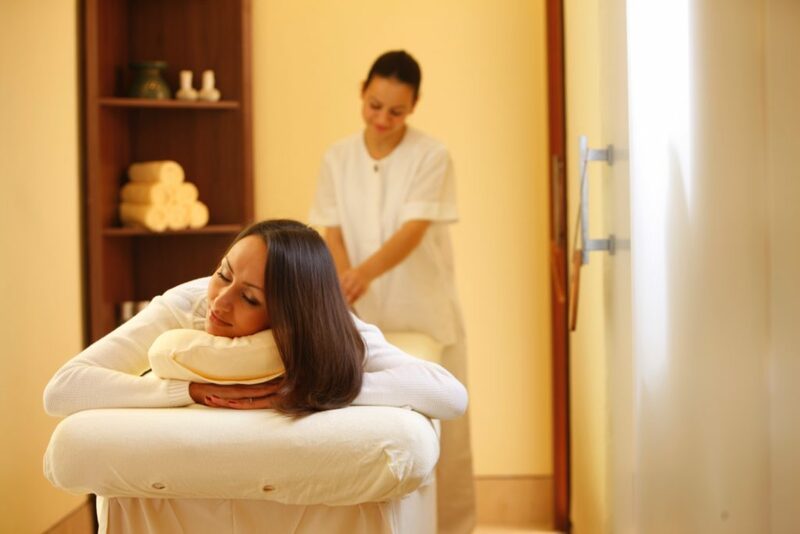 The treatments are quite short so they are not overly expensive. The buffet in the Abu Dhabi business class lounge is absolutely enormous with great quality food. 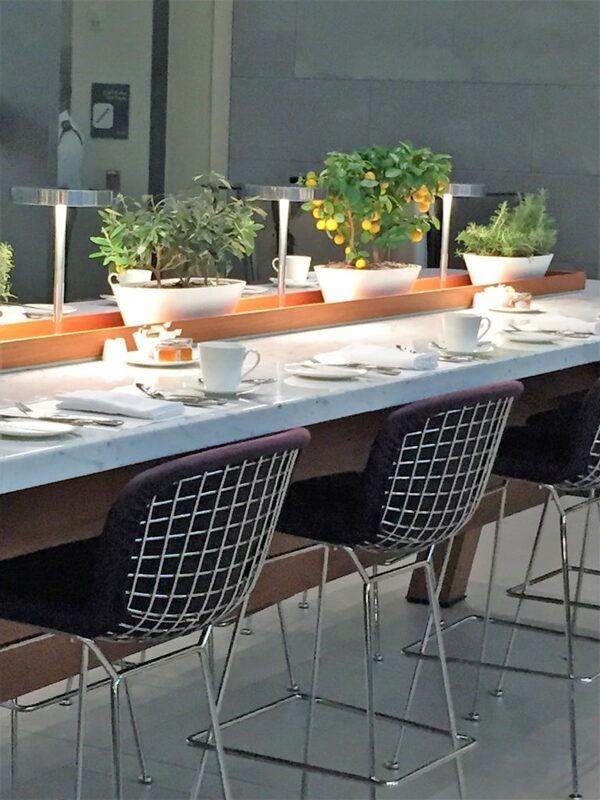 There is a separate dining area to sit in and enjoy your food. If you need to work there is a business centre and you may want to try out the semi-private Den seats in the entertainment zone where you can watch TV. All the Etihad run lounges have showers, so you may want to factor one in on your journey. The First Class lounge offers a la carte fine-dining, a spa, Fitness Room and a Relax and Recline Room. The fitness room has state-of-the-art Technogym equipment, free weights and yoga mats. For cigar aficionados, there is the First Class Cigar Lounge, with nine best-in-class varieties of cigars paired with a large selection of single malt whiskies and Cognac. If you fancy more casual dining there is also a bar/lounge menu with tapas type items. The drinks selection is impressive with 9 gins, XO Cognacs, champagne and fine wines as well as Signature cocktails. The most interesting champagne is a 2004 Billecart-Salmon which retails at over £100 a bottle. I will be doing a full review of both of the lounges next month. 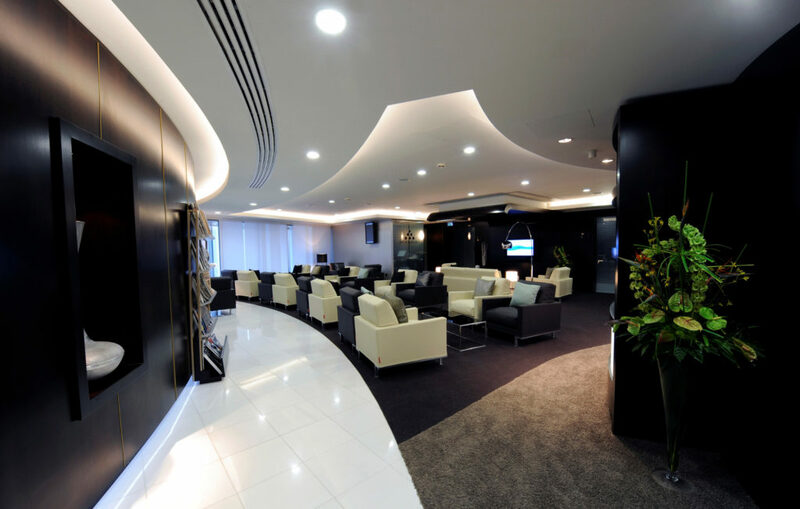 All Emirates Skywards members and their guests who are travelling on the same Emirates or Qantas codeshare flight, can access the Emirates airport lounges in Dubai by paying for access. If you are travelling in business class you can also pay extra to be able to enter the First Class lounge. The offer applies only to Emirates’ lounges at Dubai International. Fortunately for those who have paid for business or first class access is “subject to capacity restrictions” so they shouldn’t be too crowded. You can only pay by card at present, cash and miles are not accepted. 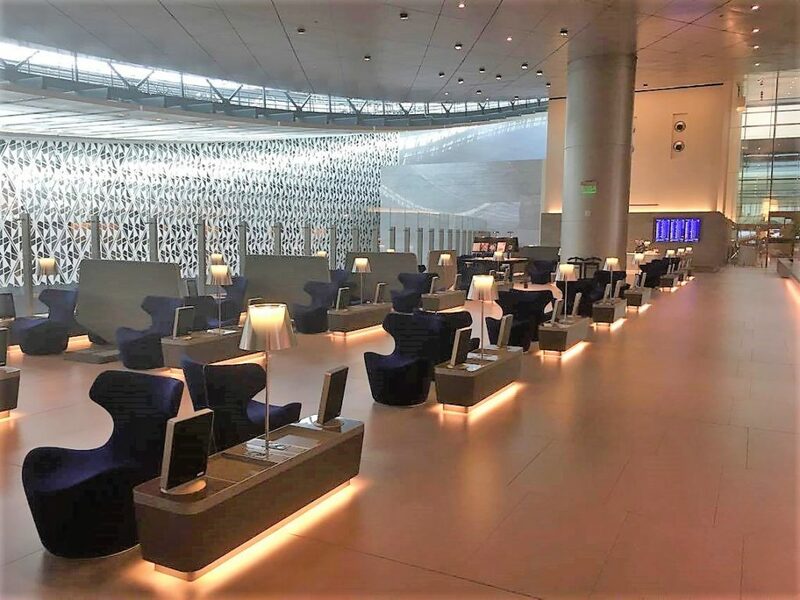 Emirates has recently completed a refurbishment of its enormous Dubai business class lounge and added features such as a Champagne bar and Costa Coffee barista bar. 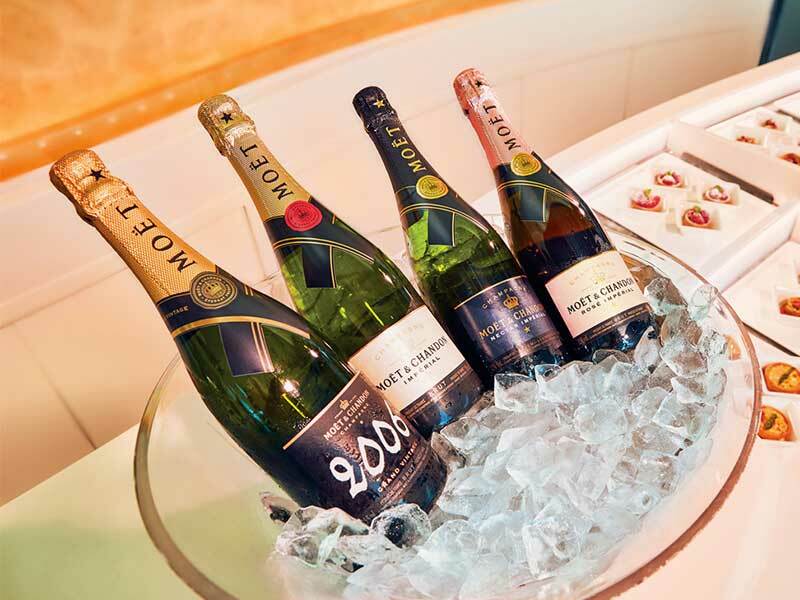 In their Moët and Chandon champagne lounge, they serve four Moët champagnes with a selection of canapés designed by Michelin star chefs. They also have a new Health Hub. It has healthy food selections such as fresh fruit selections, smoothies, juices wraps and gluten-free choices. The first-class lounge has a Cigar Bar, à la carte dining, Le Clos wine cellar, showers, quiet rooms furnished with blankets and chaise longues, Cigar bar & sommelier service and direct boarding to the aircraft. 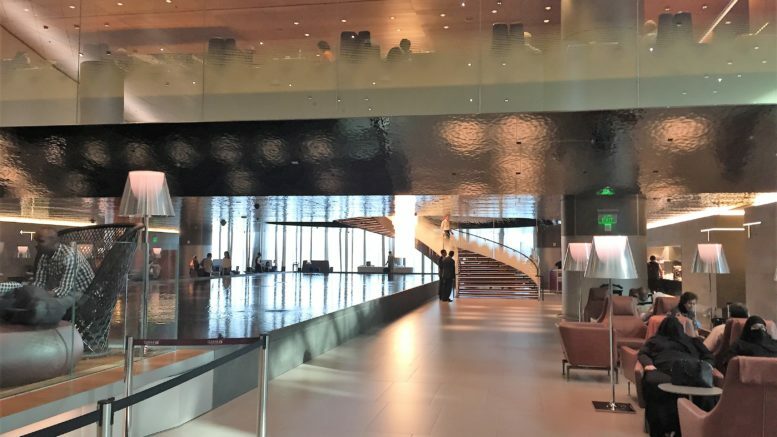 You can buy to Qatar’s Al Mourjan business class lounge and their other ‘oneworld first and business class lounges’ but paid access is limited to passengers on Qatar Airways flights booked direct with the airline – travellers on codeshare flights will not be allowed access. You also can’t get paid access on a miles redemption ticket either which seems odd. Access to their Al Safwa First class lounge is only for customer flying in First class and can’t be bought. Lounge access can be purchased at check-in counters except for Al Maha (see below). The Al Mourjan lounge is the best out of the 3 but it is the most expensive. The Qatar business class Al Mourjan lounge is one of the largest I have been in, as it’s the size of 10 Olympic swimming pools! It definitely has a big wow factor with the infinity water feature and sweeping staircase. There is a good choice of different spaces with the main lounge and cafe with made to order sandwiches downstairs and the bar and restaurant upstairs. The restaurant now only offers buffet food whereas when it first opened a la carte dining was also available. Now that the space is no longer shared with First Class passengers, they have removed the a la carte menus from the restaurant and there is no more free Krug. I fondly remember sipping a glass of Krug at 6am much to the amusement of the staff just because it was free (it is my favourite champagne). I enjoyed it when I visited but my Roving Reporter was not that enamoured on his last visit – probably due to the lack of Krug! 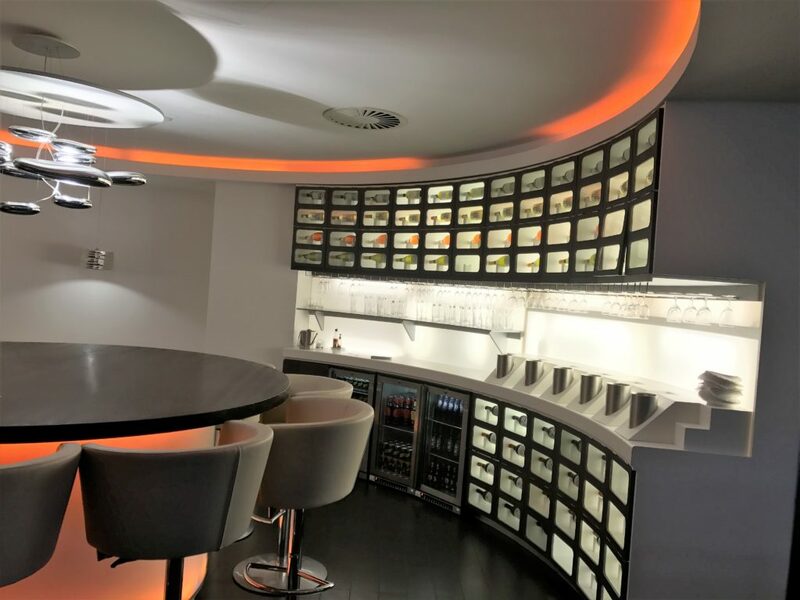 The lounge also offers private family areas with widescreen TVs and leather couches and a games room that includes a Formula 1 simulator and a children’s nursery. Other features include a business centre with workstations and printers, baggage storage and showers. The Business Class oneworld lounge is far less flashy but still has wine and spirits, a selection of sandwiches, salads, desserts, soft drinks and tea and coffee. There is a business centre too but only the airport’s wifi available. Showers and lockers are available. The First Class oneworld lounge is not what I would regard as luxurious but it does at least have Champagne (Jacquart Brut Mosaique NV). 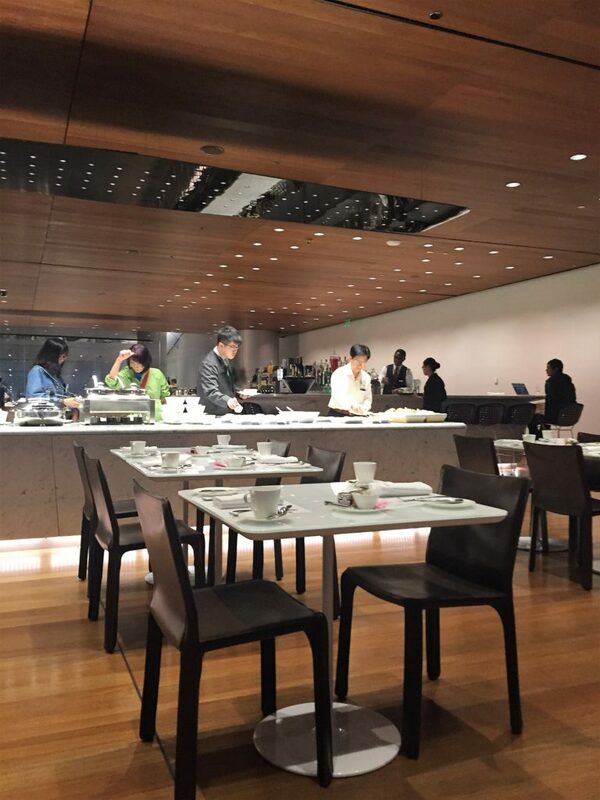 The food and facilities are similar to the Business class one world lounge. If you are interested in an arrivals or transit lounge at Doha there are also 2 further Al Maha lounges for these. There is currently an offer for up to 15% discount from 25 September to 31 October 2017. You will need to book these with Al Maha Services and you can then get up to 15% discount on Al Maha Gold and Platinum Meet and Assist Services and Lounge Products. These have family rooms, shower facilities., Wi-Fi throughout the lounge, a business centre and conference rooms, as well as a smoking area. You can find more Al Maha information here. There are also certain lounges that you can access on Priority Pass which are airline lounges. 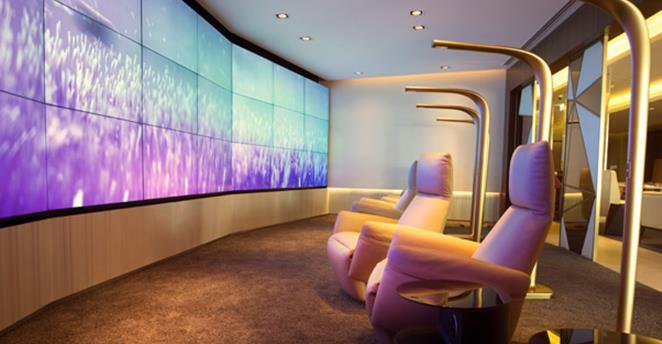 Two examples that spring to mind are firstly the Sky Team lounge at Heathrow. You can read my review here. The lounge is used by Air France, KLM and other SkyTeam airline members at Heathrow’s Terminal 4. The lounge is actually pretty good with a wine library, well-stocked buffet and plenty of areas to relax in. 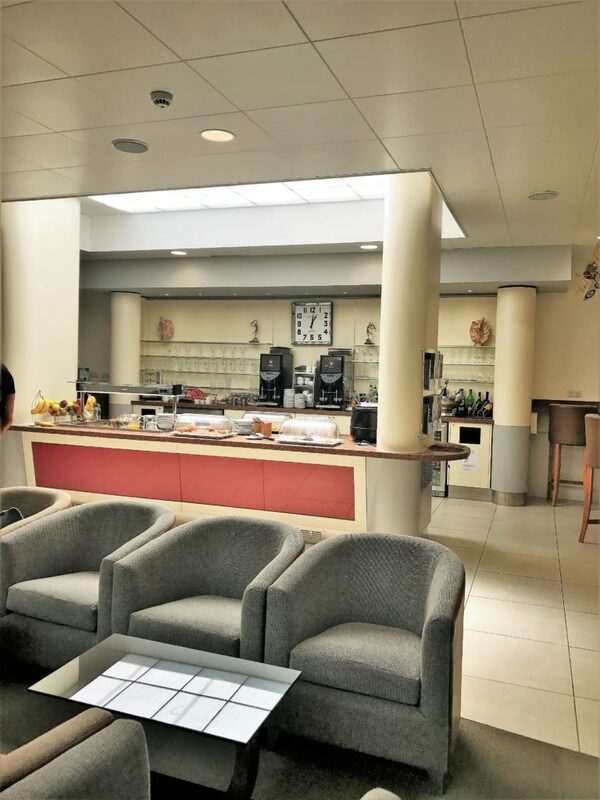 At Jersey airport, Priority Pass allows access to the British Airways lounge. This is a fairly small lounge which had a limited selection of food when I visited mid-afternoon but there was a decent selection of wines and spirits. Have you been to an airline lounge that you have purchased access to? Let me know in the comments below or on social media. Overall the prices are very high for airline’s directly selling lounge access but you do get a premium product except with the Qatar oneworld lounges. In most airports, you should be able to get a third-party lounge cheaper through one of the paid lounge access companies like loungebuddy which I talked about here. Paid airline lounge access could be bad news for premium customers, as it means that the airline lounges will be busier unless access is strictly controlled. Hopefully, the high price points will put most people off and the airlines will act responsibly rather than trying to make a quick buck. Be the first to comment on "Which airlines let you to buy First & Business lounge access & is it worth it?"